Meriton Serviced Apartments - Danks Street offers self-contained accommodations with a private balcony, just a 10 minute drive from central Sydney and Sydney International Airport. Guests have access to an indoor pool, a hot tub and a fitness center. The apartment complex is across from Moore Park Golf Course. Sydney Cricket Ground (SCG), Sydney Football Stadium and Royal Randwick Racecourse are all just a 5 minute drive away. The air-conditioned apartments have laundry facilities. Each apartment has a flat-screen TV with cable channels and a DVD player. Studios have a kitchenette, and all other apartments have a full kitchen. The property is a 5 minute walk from a number of trendy cafés and restaurants on Danks Street. A grocery store and a number of fast food options are in the complex. 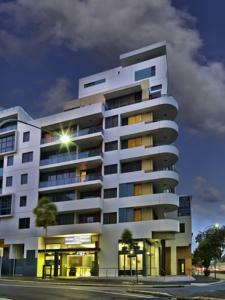 Rooms: Apartments: 167, Hotel Chain: Meriton Serviced Apartments. Wired internet is available in the hotel rooms and charges apply. Private parking is possible on site (reservation is not possible) and charges apply. Free! One child under 12 years stays free of charge when using existing beds. There is extra beds/baby beds in a room is 0 capacity for extra beds/cots in the room. American Express, Visa, Euro/Mastercard, Diners Club, JCB, Eftpos, UnionPay debit card, UnionPay credit card The hotel reserves the right to pre-authorize credit cards prior to arrival.